Spring rolls are one of my favorite dishes, ever. They’re awesome as an appetizer, a snack, or even a full on meal. I grew up with them as kind of a regular meal around the house. Once all the cook prep is done, these are easy to whip up and surprisingly filling. Best of all, they’re customizable for even the pickiest of eaters. Rather than painstakingly roll each one myself, all the ingredients are laid out on the table and everyone gets to make their own. 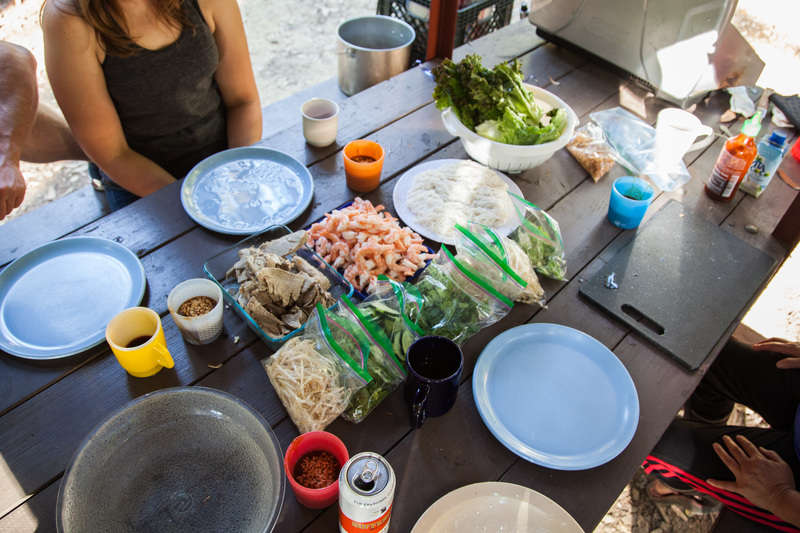 For these frontcountry spring rolls, a lot of the prep was done prior to the trip. Call it cheating, but I wanted to reduce the amount of stuff I was lugging out into the woods. The pork was boiled and sliced prior to leaving. Pre-cooked and peeled shrimp were purchased from Costco. Everything else was done the day of. To reheat, we tossed the meat into warm, but not boiling, water and drained. Noodles are boiled and then rinsed with cold water to keep from sticking. 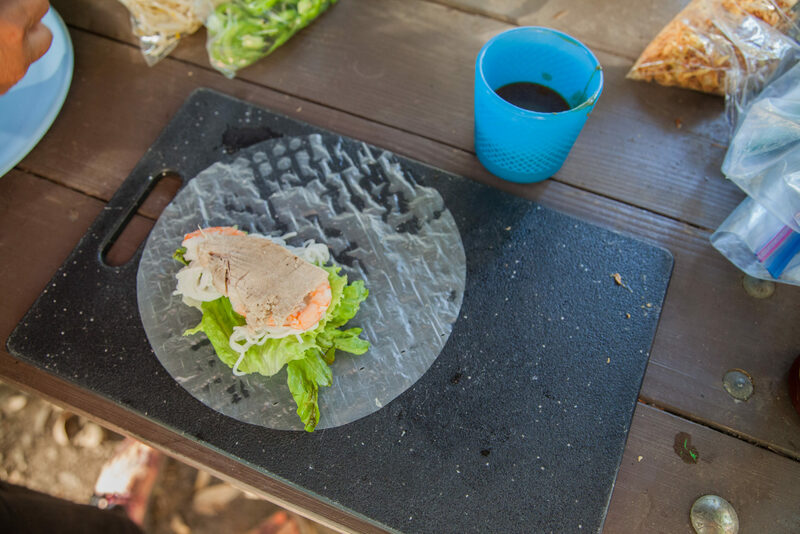 Rice paper is softened in water. Lettuce is ripped apart and placed on the rice paper. The rest of the ingredients are loaded on. Sides are gently tucked in and the paper is rolled, hoping you didn’t add too many ingredients. Let’s do it. Place the pork shoulder into a large pot and cover with water. Peel the onion. Add carrot, onion, and ginger into the pot. Add salt and pepper. Bring water to a boil and cook the pork shoulder thoroughly. Save the broth; I like using it as a soup base. Let the pork shoulder cool. Trim off fat and cut into roughly 1”x 3” thin pieces. Set aside. Cook the shrimp if they are not cooked already. Peel the shrimp and de-vein. Set aside. You can also buy them pre-cooked and peeled from Costco. Bring water to a boil. Add in the vermicelli noodles. Cook until noodles are soft and white. Drain and then rinse the noodles thoroughly with cold water, swishing them around so they don’t stick to each other. Set aside. Add a little bit of water to a pot. Add in a spoonful of peanut butter. Mix the peanut butter and the water. If it’s too thick, add a little more water. Add hoisin sauce to taste. You can make it super peanut-y or not as peanut-y. Set aside. It may congeal a bit while you are prepping. That’s ok, just heat it back up. Prior to eating, dish into smaller containers for dipping. Optional: add a dollop of sriracha to your saucer. Sprinkle on crushed peanuts, if you’d like. If you prepped the pork and shrimp beforehand, pour boiling water over both and drain to warm back up. Slice the cucumbers into thin, rectangular pieces. Fill your large bowl with warm to hot, but not scalding, water. 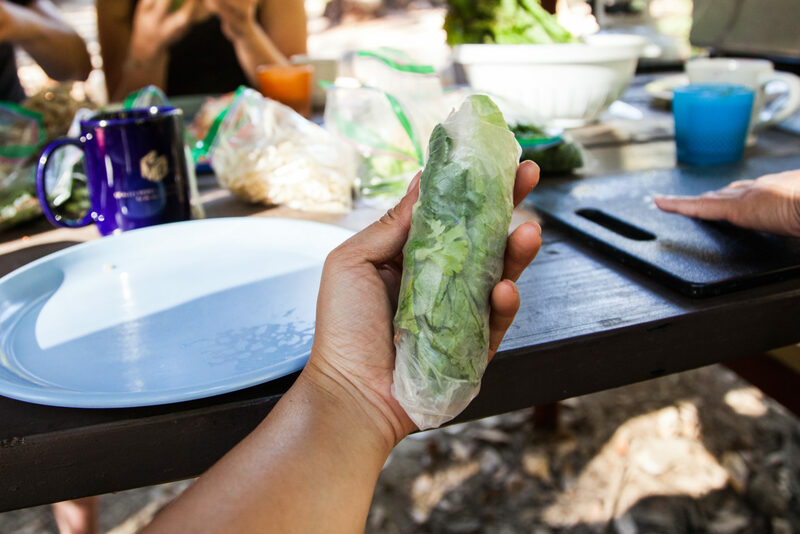 Grab a sheet of rice paper and dip the whole thing into the warm water. You may need to rotate the paper to coat the whole thing. This softens the paper. Place the paper on your plate. Rip off a piece of lettuce. I usually discard the stem. 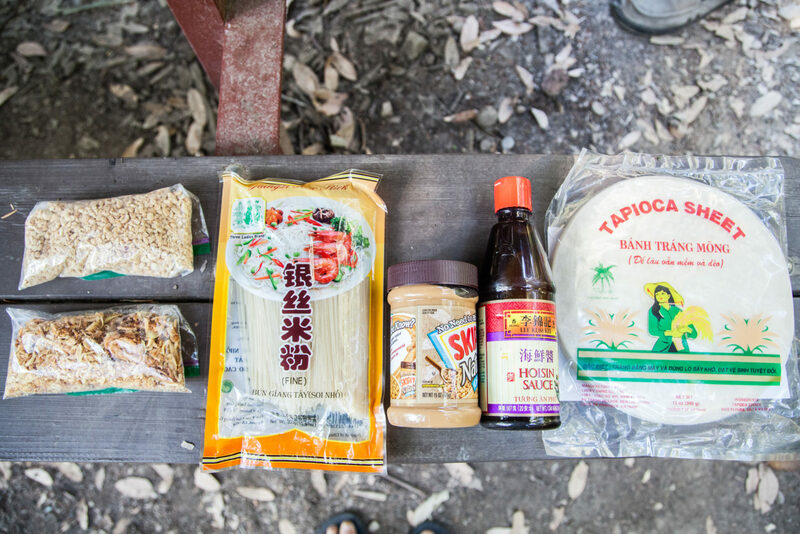 Place at the bottom of your piece of rice paper. Grab a small handful of vermicelli noodles. Place on top of lettuce. 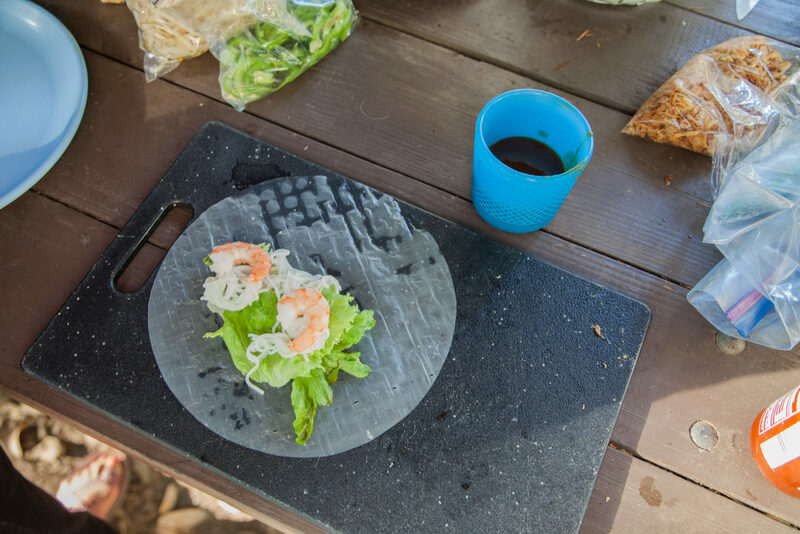 Place a few pieces of shrimp atop the lettuce. Layer on a piece of pork if you want. Add other toppings like mung bean sprouts, jalapeño, fried onion, cilantro, but not too much. You still need to roll the paper. Fold in the left and right sides about a half centimeter. This prevents the insides from spilling out as you’re rolling. Roll from the bottom up, tucking in the ingredients as you go so they don’t fall out. Dip in peanut sauce and enjoy. Great idea – simple and, as you mention, totally customizable.